Ford Shelby Cobra and Replaca Information - Pictures, Links, videos, and more! Welcome to my Cobra site. I've always dreamed about owning the ultimate car. As a teenager I owned a 67 Cuda that was in questionable shape. I would scrape together what ever resources I could to keep it on the road. It was fun and I learned a lot but it never became the car that I had been dreaming of. Instead, the Cuda became the ultimate bottomless pit, not the ultimate car. Between the Cuda and several motorcycles I grew a desire for higher performance vehicles. Between those vehicles and my Cobra a few years passed, time, family, jobs, and just life took priority. Now with a bit more gray hair I could finally get down to business! The Cobra became the unsurpassable manifestation of my dream. It combines raw beauty, handling, and power. Its power to weight ratio is difficult to match, even with a super bike. At 700 HP and 2100 lbs this is one crazy ride! Every second spent behind the wheel requires respect, or it can quickly kill you. Every time I go for a drive I get shivers up my spine. Twisting the key brings life not only to the engine, but the entire car. Driving down the road solicits many looks and comments. I almost giggle when I'm driving and see someone holding their Cellphone out the window to snap a quick photo. Even a trip to the gas station for a fill-up is an adventure. My Cobra began life in Poland in an Ex-Soviet MIG factory. 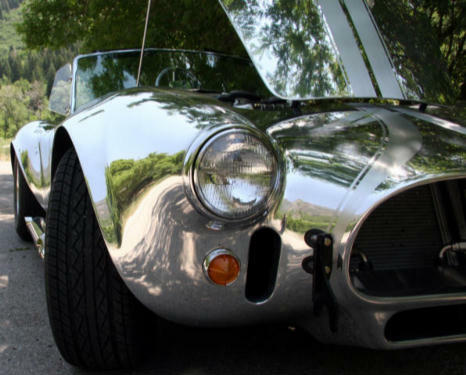 Just like the original AC Shelby Cobra, craftsmen meticulously pounded and welded many aluminum panels together to form the outer shell. 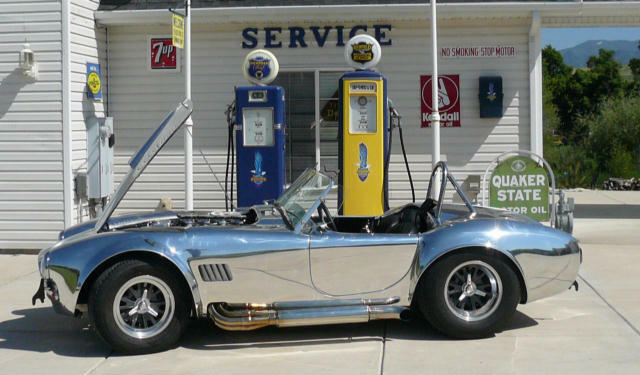 Kirkham Motorsports in Provo, Utah builds Cobras to such exacting standards that it's hard to distinguish them from the originals. Their cars are fitted with billet suspensions that are far superior to the originals, along with many other niceties. Plus, these guys are just great people to work with. In my life I've NEVER regretted buying quality, and my Kirkham is no exception! The power plant was built by Keith Craft Racing, great people also. The engine is based on a 427 FE big bore aluminum Shelby block. Bored and stroked out to 527 CI. Stage three heads, roller cam, roller rockers, and a steel crank. Sitting on top of the engine is TWM injection controlled by a F.A.S.T computer. It purrs like a kitten, really! All this is followed by a TKO 600 gear box feeding into a Kirkham built independent rear suspension. I echo the universal sentiment of many Cobra owners that I wish I would have done this sooner. It is fun to work on and fantastic to drive!